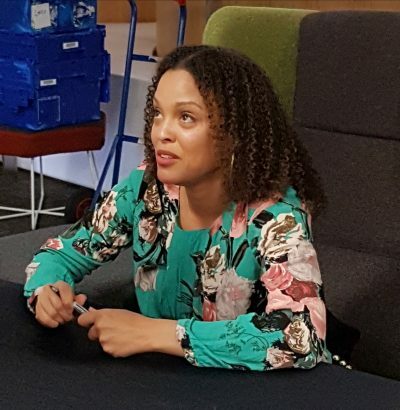 It’s been quite a week for Mississippi author Jesmyn Ward. When she arrives in Manchester for her MLF event, she’s already made several appearances in London, Bristol and Paris. Her latest novel Sing, Unburied, Sing has also made the shortlist for The Women’s Prize for Fiction. Host Anita Sethi introduces Jesmyn by detailing some of the praise and awards she’s received but keeps the list short saying it would take the full hour to read it all out! Anita begins by asking Jesmyn about the title of Sing, Unburied, Sing. Jesmyn says she sat with the work, after she’d gone through 15 revisions, to try to find a title that would intrigue the reader. The word sing is used twice because of the rhythm it provides. It also relates to the magic in the book and the way the characters perceive the magical elements through sound. The ghosts in the book are set against this harmony. The word unburied encompasses those who lived and those who are dead but who wander. Jesmyn says that offering a sense of beauty and hope in the work is important. ‘We are more than our trauma. The people I write about have been reduced to our trauma for a very long time.’ She says she feels a responsibility to write against that and wants her characters to feel tenderness, kindness, joy. The conversation moves on to the narrators of the novel. Jesmyn says she chose three first-person perspectives as a challenge to herself as a writer. She also wanted to allow several characters to have a voice as they are the kind of people who’ve been silenced historically. Jojo is 13. He’s poor and mixed race. His dad is in jail. He’s at a really important point in his life where he’s perceiving the world differently and is trying to work out how to walk through the world and the American South as a black man. His mother, Leonie, is difficult to like but Jesmyn wanted her to have a chance to speak too. The third narrator, Richie, is the ghost of a 13-year-old boy who was incarcerated in Parchman prison, a plantation. When Jesmyn was researching she found out that children as young as him were sent to Parchman and she felt it was important to include him. Anita asks how place has shaped Jesmyn as a writer. ‘I believe place determines nearly everything about a writer and about a character’. She’s very aware that she’s from Mississippi and she draws from her experience. Writer Celeste Ng has said of Sing, Unburied, Sing that it’s ‘A searing read for anyone who thinks the shadows of slavery and Jim Crow have passed, and anyone who assumes the ghosts of the past are easy to placate. It’s hard to imagine a more necessary book for this political era.’ Anita asks Jesmyn how much her characters are shaped by time. Jesmyn says there’s a push to disavow the impact of history and time in the States at the moment and she’s attempting to push back against that. ‘It’s very clear to me that the past is present too. It weighs heavily on my characters.’ The traumas Pop experienced when he was younger affect how he interacts with his children and grandchildren. Leonie’s trauma when her brother is murdered is passed on to her children. Jesmyn says that in each of the five books she’s written, she’s writing about time and history again and again. Asked what prompted her to edit the anthology The Fire This Time: A New Generation Speaks About Race, Jesmyn talks about the murder of Trayvon Martin and the acquittal of George Zimmerman. Seeing Trayvon Martin tried for his own murder was ‘new and evocative for me. It made me very sad to realise he was just a child. He should’ve been recognised as a child and he wasn’t’. Frustrated, she spent a lot of time on Twitter looking for people pushing back against the narrative being spun in the media about Trayvon Martin’s death. Because of the nature of the platform though, the interesting, comforting things these people said were difficult to find again. Reading James Baldwin’s The Fire Next Time in the library struck a nerve (‘He was honest and frank and would make himself very vulnerable on the page.’) and led Jesmyn to ask contemporary writers and scholars to contribute essays and poems to a new collection. Did Jesmyn see her own experience in books when she was a child? ‘It was definitely something I yearned for.’ Jesmyn says she was a prolific reader and realised quickly she was drawn to books with protagonists who were girls. They had more agency when she herself felt powerless. 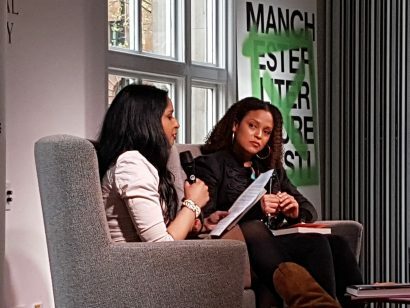 ‘They were unruly and loud and I admired them.’ She didn’t see any modern, poor black girls in these books though and plans to begin working a book for 10-13 year olds soon.